Not all IP supports stringent automotive requirements. IP suppliers play a key role in the automotive supply chain to enable high-performance advanced driver assistance system (ADAS) SoCs. Vision-based SoCs may contain a high amount of third-party IP to implement the key embedded vision, sensor fusion, multimedia, security and advanced connectivity functions. And while IP suppliers have permeated the semiconductor ecosystem for consumer, mobile, PC and communications applications, not all IP suppliers can support stringent automotive level requirements. As automotive designers initiate the next generation of their ADAS SoCs, they must assess IP suppliers’ capabilities to provide ISO 26262 Safety Packages with ISO 26262 certification, AEC Q100 testing and TS16949 quality management and audits. IP suppliers with the commitment and resources to meet automotive industry requirements help ensure the success of automotive SoC suppliers, Tier 1s and OEMs in meeting the functionality, performance, quality and reliability levels required in ADAS SoCs. ADAS SoCs have specific design criteria from both the application and systems perspective to ensure an efficient SoC design implementation. Designers need a combination of high-performance and power-efficient IP functions (Figure 1) to help deliver total system throughput and meet the real-time quality-of-service requirements. The application processor performance requires at least 32-bit class processors running at more than 1 GHz. In fact, ADAS SoCs that support multiple vision-based applications are starting to migrate to 64-bit processors. In addition to the high-performance application processor, ADAS SoCs require a separate vision processor to implement latest vision algorithms such as Convolutional Neural Networks (CNN). An additional graphics processor or customized DSP core handles high-rate pixel processing connected to a multimedia interface such as HDMI or MIPI D-PHY, which together support the increasingly large high-definition displays. To support the multiple camera and radar sensors supplying image and radar/lidar data, a sensor and control sub-system that offloads the application processor from sensor data management duties will enable the high degree of sensor fusion. 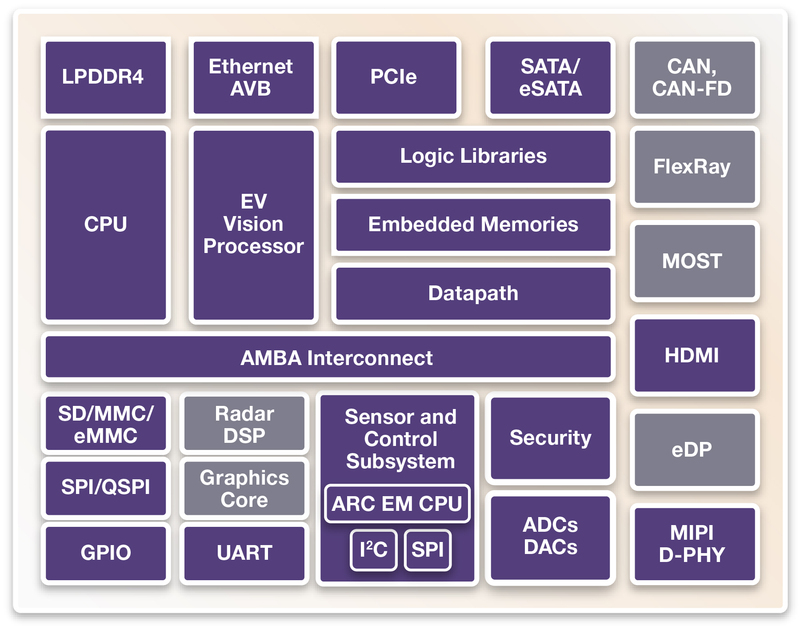 ADAS SoCs require up to 8GB automotive-grade LPDDR4 memory to support the processor application software and extensive system connectivity provided by Ethernet AVB and Time Sensitive Networking (TSN) to support multimedia data traffic. SoC peripherals such as PCI Express, SATA, UARTs, SPI/QSPI , CAN, and FlexRay offer additional interface connectivity. Finally, to support cloud connectivity enabled by an external Bluetooth Smart, WiFi or 4G LTE radio IC, ADAS SoCs must include robust hardware-based security protocols for secure boot, secure identification and authentication, encryption, and decryption. An extensive IP portfolio supporting the latest protocols and algorithms in leading foundry processes provides the foundation for next-generation ADAS SoC development. In addition to providing the advanced features, small area, high performance and low power required by ADAS applications, IP suppliers must meet the stringent functional safety, reliability and quality management demands of the automotive supply chain. Although SoCs in high-performance consumer and mobile applications contain similar functions as ADAS SoCs, the additional robustness, reliability and safety requirements of automotive SoCs place additional requirements on IP suppliers. The AEC Q100 standard ensures components are qualified for use in harsh automotive environments. The specification contains a set of failure mechanism-based stress tests and conditions that semiconductor SoC suppliers use to qualify their SoCs at various temperature grades. Although the AEC Q100 qualification applies to SoC-level components, IP suppliers can maximize designs’ qualification success by performing AEC Q100 testing for IP. IP providers that perform AEC Q100 testing for their IP and provide characterization reports for key tests such as Accelerated Environment Stress Tests, Accelerated Lifetime Simulation Tests, Die Fabrication Reliability Tests, and Electrical Verification Tests validate that the IP meets the robust reliability requirements demanded by automotive customers. Only IP suppliers that work closely with leading process foundries and leading semiconductor and Tier 1 suppliers can help designers operate their SoCs at automotive temperature grades and mission profiles for ADAS applications. The goal of ISO 26262 is to minimize susceptibility to random hardware failures by defining functional requirements, applying rigor to the development process and taking the necessary design measures including fault injection and systemic analysis and metrics reporting. As ISO 26262 cannot be retrofitted to a device, IP providers must institute a safety culture with policies, processes, strategies and empowered safety managers involved with safety critical IP development. The deliverables or “Work Products” of an ISO 26262-certified IP Safety Package include integrated hardware safety features, verification plans, safety plans, verification reports, safety manuals and Failure Mode Effect and Diagnostic Analysis (FMEDA) to be used by SoC designers as input to their SoC-level FMEDA report, thereby accelerating their SoC development. TS 16949 quality management defines the development of a quality management system that provides for continual improvement, emphasizing defect prevention and consistency in the automotive supply chain. Design centers and IP suppliers for the design of automotive products may form part of the audit for the design/manufacturing of the SoC but cannot obtain stand-alone TS 16949 certification. As design centers for the SoC can be part of an overall TS 16949 certification, selecting IP suppliers with a deep understanding and commitment to implement and follow the required development processes, best practices and quality specifications will help designers meet automotive quality levels. The growth of safety features in today’s automotive SoCs requires IP providers to put strict processes in place to help ensure that the IP meets stringent functional safety standards. IP that offers ASIL B Ready certification, AEC Q100 testing and TS 16949 quality management helps designers accelerate the qualification processes for their ADAS SoCs. The high-quality DesignWare IP portfolio with ASIL B certified IP accelerates SoC designers’ ISO 26262 functional safety assessments to help reach their target ASIL levels.